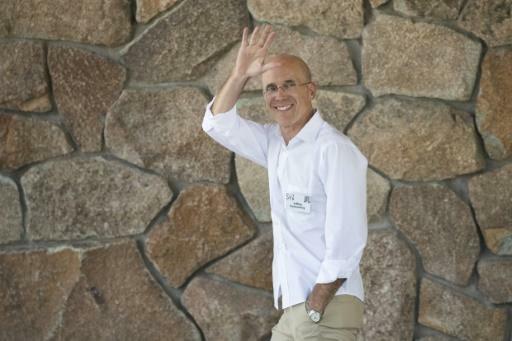 Former Walt Disney Studios chairman Jeffrey Katzenberg has raised $1 billion in initial funding for his NewTV start-up seeking to tailor television to smartphone lifestyles, pulling in Hollywood's biggest studios. Disney, 21st Century Fox, MGM, Sony Pictures and Warner are among the investors in NewTV, a working name for the new company, Katzenberg's WndrCo company announced Tuesday. Katzenberg, 67, co-founded DreamWorks in 1994 with Steven Spielberg and David Geffen, overseeing production of hits such as "Shrek". Before that, his stint at Disney spurred the studio's Renaissance with animation successes such as "Beauty and the Beast," "Aladdin" and "The Lion King". He has brought on board Meg Whitman as NewTV's top executive. One of the most prominent women in Silicon Valley, she was chief executive of Hewlett Packard Enterprise from 2011-2017 and of eBay, from 1998 to 2008. Katzenberg will remain in charge of content. NewTV, being nurtured into existence at WndrCo, envisions high-quality shows being custom-designed to be consumed in 'bite-sized' formats of 10 minutes or less on people's mobile phones. No other platform has so far managed to monetize the format, other than through advertising, with the market flooded by free content dominated by the likes of Facebook and YouTube. Whitman told television network CNBC that Hollywood studios were on board because the new platform is "a growth area" that would allow stories to be told "in an entirely new way." She described the market as "enormous," estimating that two billion people spend an average of an hour a day looking at videos on their smartphones. To develop a platform optimized for cell-phone use, NewTV has partnered with China's online sales giant, Alibaba. NewTV's target launch is Christmas 2019, Whitman told CNBC.